My presentations focus on the art and craft of writing and are designed to be entertaining as well as informative. Practical examples are given throughout to illustrate important points and writing techniques. Presentations and workshops can be tailored to fit the age and experience of audiences from twelve to adult. Teachers have found my sessions extremely useful for helping students with their creative writing folios whilst at the same time providing everyone with an enjoyable and memorable experience. If you would like to make a booking or just get more information please email me here. By the way, if you would like to order signed, dedicated copies of any of my books for your pupils, book group members, or teen relatives please contact me with details and I’d be happy to post them on to you. My email address is: liz.rettig@btinternet.com. 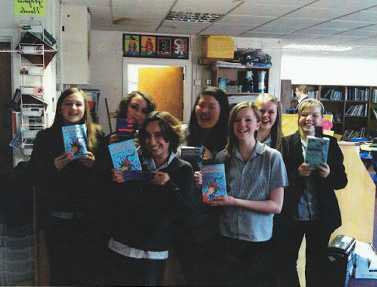 Here is a beautiful picture of the girls in Anna’s book group from Heart of England School receiving their dedicated copies. I think they liked them!